Curated by Alison Gass and Jennifer Carty, The Figure and the Ground is the first of three exhibits in the Smart Museum’s new series: “Expanding Narratives.” It charts the relationship between figure and ground through major art movements such as surrealism, cubism, abstract expressionism, and material expressionism. True to its title, the exhibit begins with Kerry James Marshall’s “Slow Dance,” a mixed media and acrylic depiction of a black couple slow dancing in a living room. The piece puts the viewer in the headspace of the exhibit before taking them through very traditional, naturalistic depictions of European bodies in paintings by Regnault and Gerome to more modern works. The gallery space was recently expanded in order to house the new exhibition, connecting the Landes and Gray galleries to allow the viewer to walk chronologically through many centuries’ worth of art depicting the relationship between figure and ground. 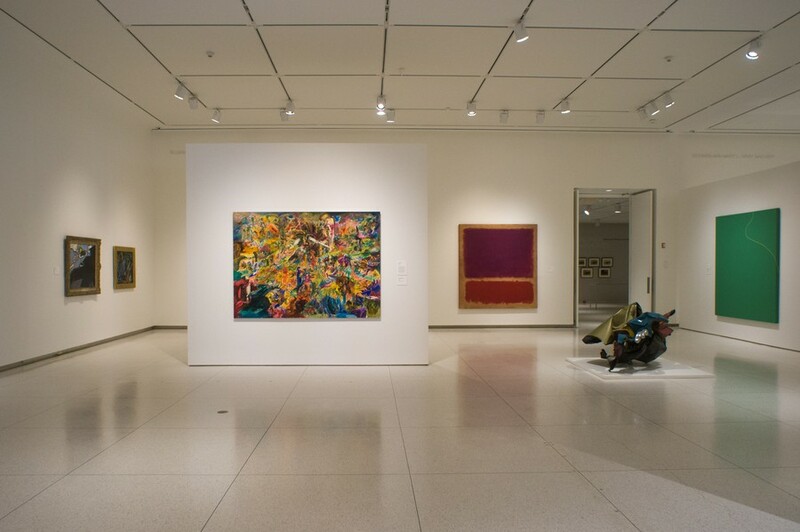 Composed of art from the Smart Museum’s collection as well as works on loan from UChicago alumni and Chicago collectors, the main room exhibits the move into abstractionism and the eradication of the figure. In earlier pieces, the relationship between figure and ground is fairly distinct, but as the viewer progresses through the gallery, it becomes more muddled. The material abstraction section of the exhibit represents the deterioration of the figure, as paintings like Virginia Jaramillo’s “Green Dawn” play with the idea of the figure moving and bending around the canvas of the painting. While women artists are typically underrepresented in the field of abstract expressionism, works by three women—Mary Abbott, Joan Mitchell, and Lee Krasner—are on display to represent that artistic movement. These works represent what is traditionally a predominantly male art scene, challenging notions as to whose art is deserving of museum space. This idea is explored further in the section titled “Identity Politics and the Performative Body,” in which the defined figure returns, and the viewer must question its place in the art and in society. Most notable is Kehinde Wiley’s “Easter Realness #4.” Known for his rendering of Obama’s presidential portrait, Wiley is famous for his naturalistic paintings of African Americans. In “Easter Realness #4,” he takes influence from traditional western cathedral paintings by replacing cherubs with young black men. As these angels have a different relationship with the ground than we do, and since they are angled upward (as if they could be viewed more properly from the ceiling), the painting complicates the figure-ground relationship and forces the viewer to evaluate the political implications. Another highlight was Nick Cave’s “Soundsuit,” the only wearable piece of art in the museum. From a distance, the suit resembles a bear, but up close it is clearly seen to be made of twigs, wire, and a basket. It obscures the figure that wears it, erasing any physical identifying factor such as gender or race. It plays with the idea of the figure—while it is in the museum it is not worn— so it is therefore both a figure and not a figure. *The Figure and the Ground* ends with interesting works made of monochromatic film reels and lights like Jim Campbell’s pixelated footage of the 2017 Women’s March and Richard Prince’s “Good Painting (Flowers),” which allows the viewer to conjure an image in their head. One of the last pieces in the exhibit is Jeppe Hein’s “Why are you here and not somewhere else,” a neon sign previously on view in the Booth School of Business. As first-year gallery attendant Livia Mann said, “It turns you, the viewer, into the figure, and the museum into the ground,” collapsing the ideas of the figure and the ground and prompting the viewer to question their relation to the art and the museum.